PUBG (PC Version) is the 2nd Best Selling PC game (24 Million copies sold) in just 1.5 years of its release (Early Access Beta was released in March,2017 and final release in December,2017) and is just behind Minecraft (28 Million) which was released on November 18,2011. It is also the best-selling Xbox One video game by total copies sold (5 million) and 6th Best Selling video game (40,000,000 units sold). These are just few of all achievements. It won many awards too. Nobody had imagined that this game will be available for Android that too for free. If you still don’t know about this game, don’t worry, you will know in some time. 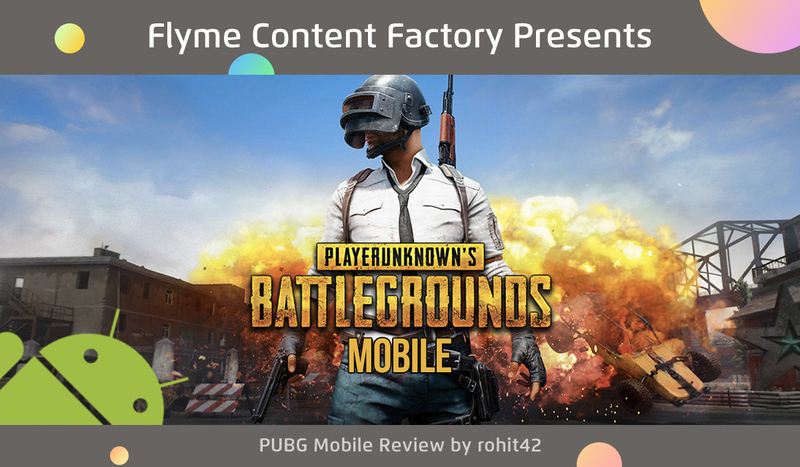 This is PUBG Mobile Review + Mini Tutorial. “100 players parachute onto a remote 8x8 km island for a winner-takes-all showdown. Players have to locate and scavenge their own weapons, vehicles and supplies, and defeat every player in a graphically and tactically rich battleground that forces players into a shrinking play zone. 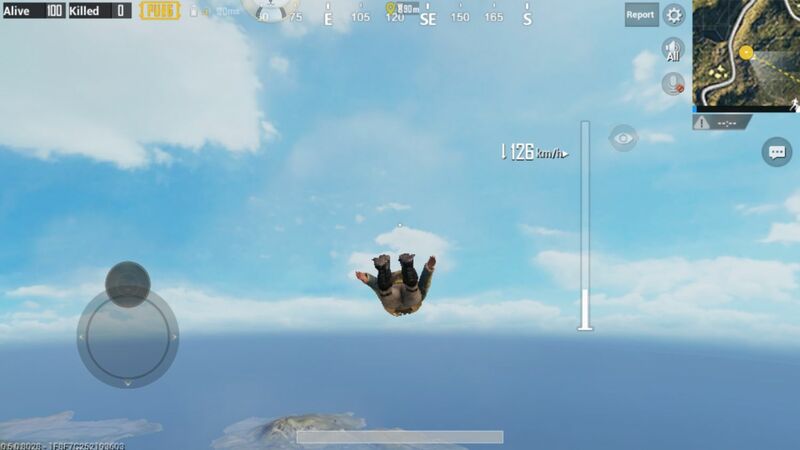 Get ready to land, loot, and do whatever it takes to survive and be the last man standing!” – PUBG Mobile Play Store Descr iption. Okay, I have installed it but how to play? 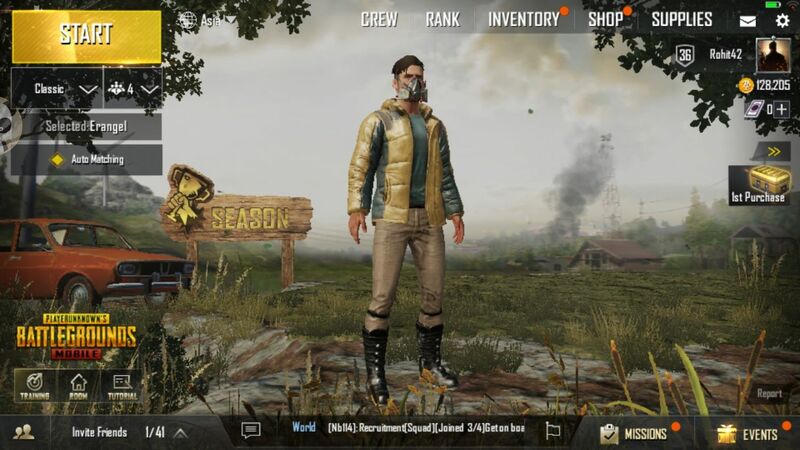 When you open the game, you will get 3 options before getting to main screen (lobby actually) – Guest, Twitter and Facebook. If you want to try this game first, just tap on “Guest” to get to lobby. And if you found the game interesting and you want to sync your game progress and data, you can do it by tapping on any of the social media button – FB or Twitter and it is just one time sign-in so you don’t need to choose any of three option every time you open the game. You need to create your character (skin tone, hair style etc) and give it a name for the first time you play the game. Also graphics will be automatically selected by the game on the basis of your device. From here, you can start a match. Below Start button, there is mode selection – Classic or Arcade and Solo, Duo or Squad. In Solo, you will battle alone against 99 players. In Duo, you will battle against other 98 players. In Squad, you will battle against other 96 players. Players other than you or your team can be Solo, Duo or Squad. 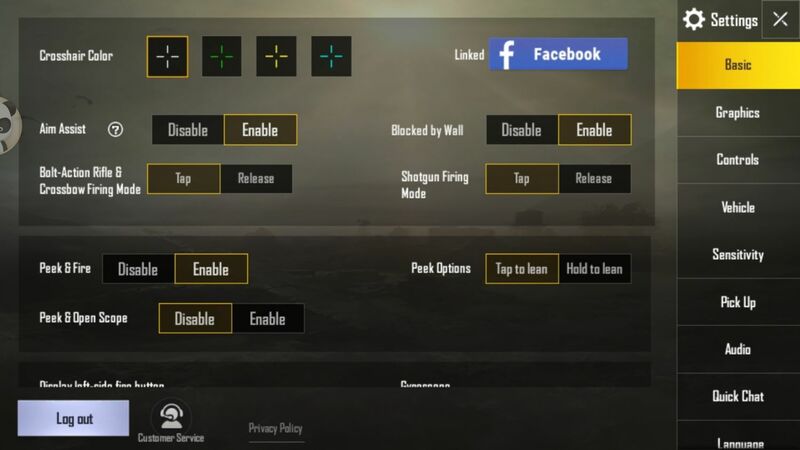 Below the modes, you can choose maps – Erangel or Miramar. Miramar is 6*6KM desert map while Erangel is 8*8KM normal map (Green+Water). You can either choose any of 2 maps or if you select both, any one of them will be chosen randomly. Below map selection is – Matching. If you select Auto Matching in Duo or Squad, your team members will be selected randomly. You can add your friends (max 3) and play with them in Squad but in case you have only 2 friends to play with and you don’t want a random player in your team, you can disable auto matching. On the right of the Match controls, there is server selection option. You can choose best suited server according to your needs or latency. On Bottom Left Corner, there are 3 options – Training, Room, Tutorial. And Friends option below them. In Training, you can practice with all weapons available in game. You can even do driving practice there. As some weapons are so rare that you will not get them easily in real game, you can try them here and can find which is best weapon. Room is only for official PUBG team members as of now. PUBG team can create a custom server (Room) with a Name and Password. Advantage of Room is that instead of random people, you can play with your 99 or more friends. It can also be used for hosting tournaments. Tutorial is one you should look for if you are new. Check this section and you will know about how this game works and how to play. You can invite/add your friends by their user name or can accept requests to add friend in Friend Section. There is invite friends option in which your friends list (added + FB/Twitter) will be shown with a green dot on name if he/she is online. 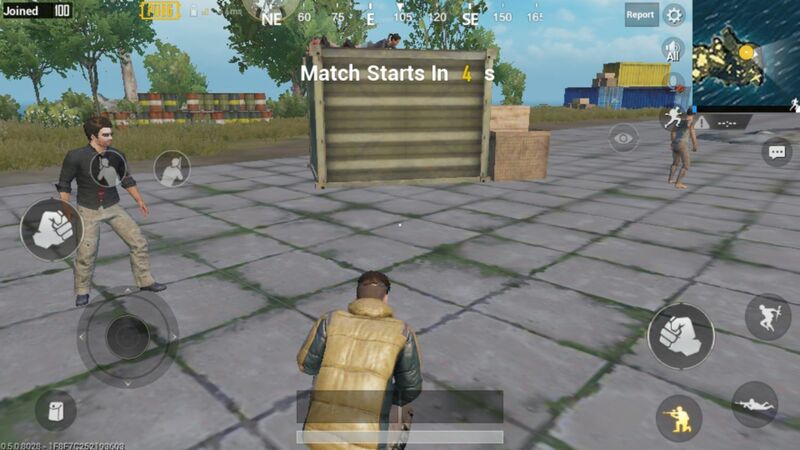 If he/she is online and you sent invitation to him/her and he/she accept it, he/she will appear in your lobby and you can tap on Start button to play the match with him/her. There is Chat box right next to invite friends and you can chat with user all around the world or your teammates. There are Missions and Events right next to chat box. 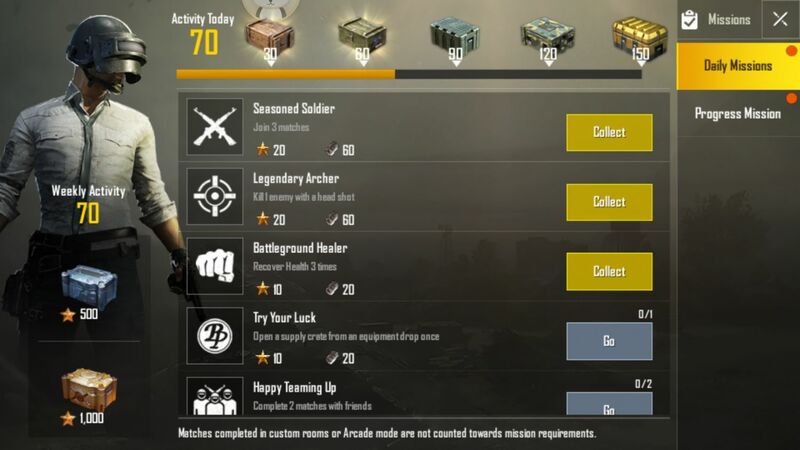 Completing a particular Mission or Event give you reward which can be either BP (coins) or Skins. One permanent event is – daily sign in which you get rewards if you sign in daily. All missions are permanent as of now. So, we only get interesting new Events regularly. In starting you will not have any cloths (except underwear off course). You can get cloths (skins) from missions and rewards or you can even buy them. If you tap on Season, it will show your stats in the particular season in all 3 modes – Solo, Duo and Squad. As you progress further with every match you play, you will climb to higher league and your level will increase. You can swipe left/right on your character to check it from other sides too. On top right, there is – Crew, Rank, Inventory, Shop, Supplies, Email/Messages, Settings and Profile. In Crew, you can see stats of all you friend you had ever played with. In Rank, you can check your rank globally in current season. 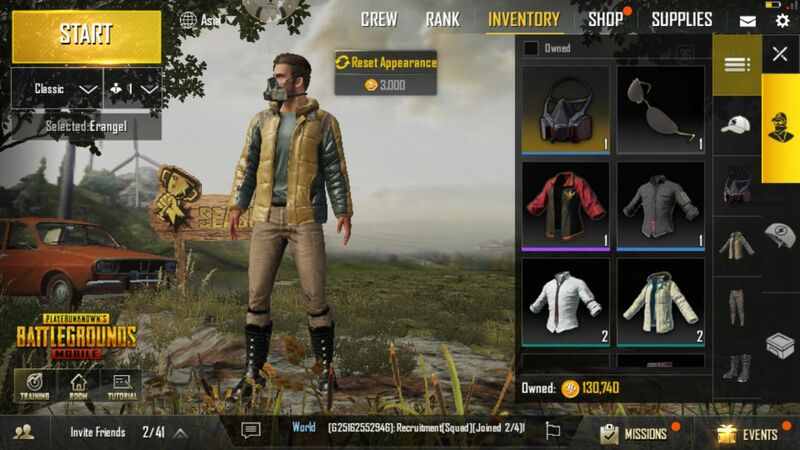 Your Skins, crates and parachutes are available in Inventory. You can customize your character appearance from here. From Shop, you can buy skins to customize your character’s appearance. Supplies can be bought using BP. You get BP from missions, events and matches. PUBG official send your important notification in Messages. Also you can send BP to your friends and your friends can collect them from messages, similarly you can collect BP from messages sent by your friends. In Profile, you can change your avatar and frame. You can unlock avatar and frame by completing some missions. For example – Get 10 kills in a match. There are some other intersting stuffs too in this section. The options are self-explanatory and you will get them easily. So, you have checked the tutorial section in lobby and just started a match. Now what are the rules really? In 8*8 KM area players can hide in bunkers or houses forever as there is no time limit. How the match will end? When you start the match, you will be given 60 seconds (Classic) or 30 seconds (Arcade) to get you ready. If you are playing Duo or Squad, you can use in-game voice chat to discuss strategy during this time. You can check your controls too. You will see other 99 players on a small island. You can punch them but you can’t harm them on this island. It also allows you to make sure your internet connection is fast enough to play the match. There is a map in top right corner now with mic+speaker icons on its left. You can turn the mic/ speaker on or off. Also there is quick messages and chat option in right side below map. You can type a message for your team mates or use quick messages. 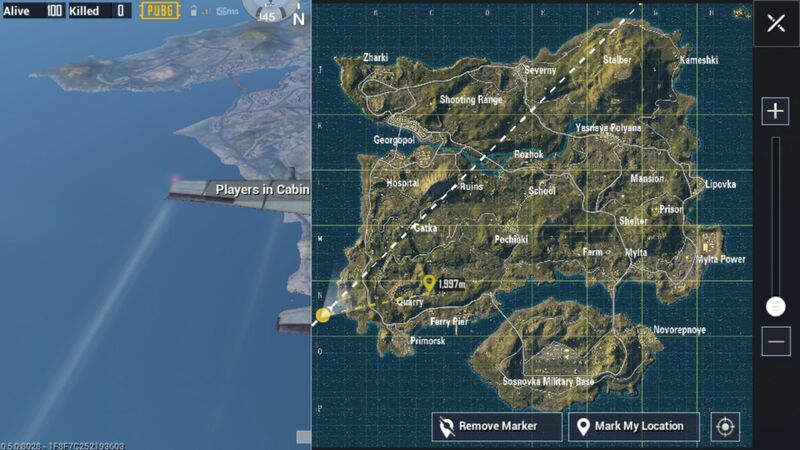 After the 60/30 seconds are over, you are now on an Airplane with other 99 players. You need to jump to any place in Map to get the weapons and Health Supplies. You can tap on map to see the map in full screen, you can mark the location by taping on any location and then close the map. You can even Zoom the map using 2 finger pinch or Zoom slider. There is location indicator on top now(Directions + Values). You can use the movement control in left bottom to move you character and can either press on Jump (will be available when you are close enough to ground to open the parachute) or the parachute will automatically open when it reach very close to ground. You can check the Marked location direction and distance on top. Swipe left/right/up/down in screen to change your direction. You can also follow your team mate in the parachute or send request to team mates to follow you. After you land on ground or location you marked, you need to find Weapons and Health Resources fast to keep yourself alive and kill other players. 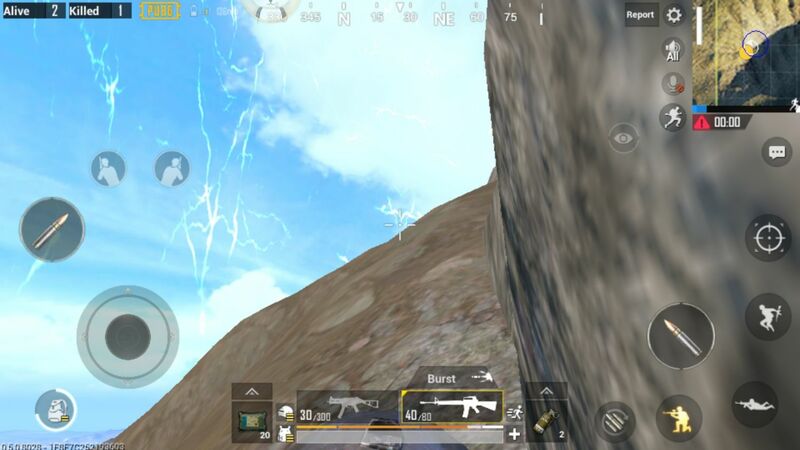 After few matches, you will know which weapons are best and what are good location for loot. And here comes the most interesting part – Zone/Circle. As the map is so big for 100 players and the match should over in less time, there are 3 zones – Red Zone, White Zone/Circle, Blue Zone/Circle. When you land on map, you will see 2 circles – Blue and White. Blue will be always bigger than White circle. There will also be a timer under the map on top right. In starting, the blue circle will be bigger than the map so you don’t need to worry. And the white circle and timer are related in a way that you need to move/go to white circle before timer reach 0. White Circle or Play Zone will always appear randomly inside Blue Circle. After the timer reach 0, blue circle will start shrinking to the white circle. The time blue circle takes to shrink to white circle will always decrease every time. So you can manage to stay outside the White circle even the timer reach 0 for some time in First Blue Circle as it so big that it takes a long time to shrink. But you can’t do this in next circles. They will shrink faster every time. 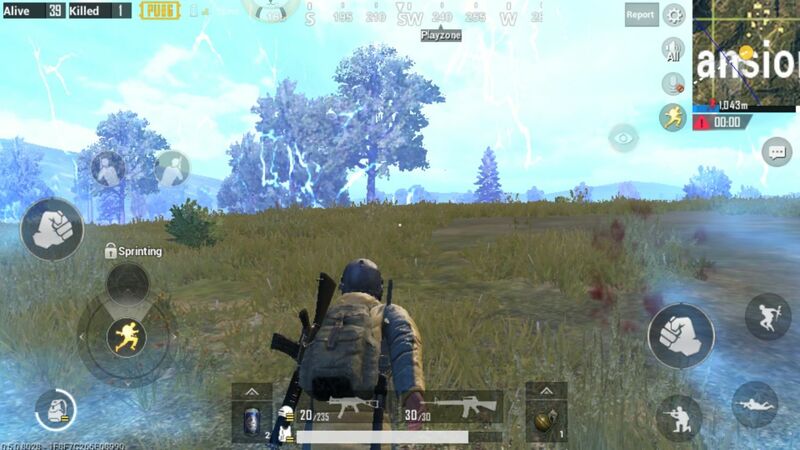 If you don’t reach White circle in time and Blue circle is shrink to White Circle, you will lose health gradually and you can even die if you stay out of Blue circle for a long time without Health Resources (Bandage, Health Kit, Med Kit, Energy Drink, Painkiller etc.). 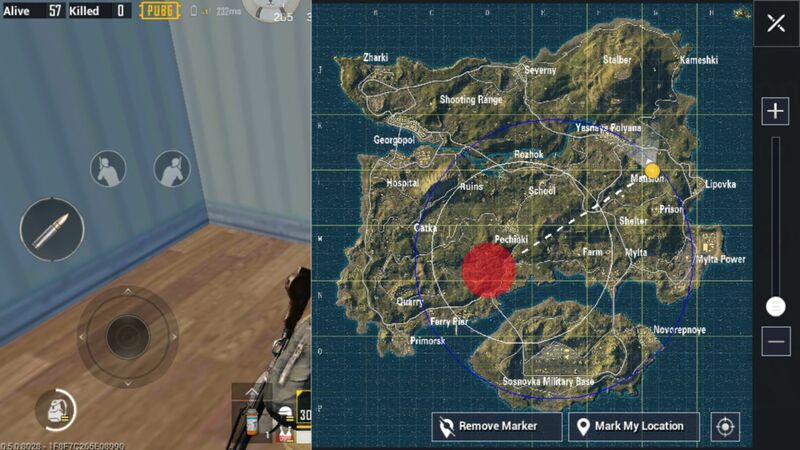 This health damage per second outside blue circle will also increase with every blue circle. Circles will get smaller and smaller as the game progresses. Red Zone is different than the other two. It is a very small area inside Play Zone. A Red zone is a danger zone which occurs randomly on map after the game begins. After a certain period of time, the zone gets bombed and once hit, player receives great damage. If you're in a building within the red zone or out of the red zone, you can avoid the bombing. There are Air Drops too regularly. You will hear the sound of Air Plane and it will drop some rare weapons or skins in a crate with parachute. You will red smog over the drop when it is on ground. But beware or other players, it’s not easy to loot an air drop as many players try to loot it. Sometimes players use air drop as a trap to kill other players. Also, there will be lot of bots below a certain level (say level 10). So that you can feel confident. But after you reach higher levels, you will find it difficult to win. Okay, I played it but it is lagging in my phone. There can be two reasons – Slow internet connection or Low RAM. This game requires at least 2gb ram and a reliable internet. This game requires some top notch GPU to play it on highest graphic settings. You can play it on low-end devices too but on low graphics settings. The difference in Low and High Graphics settings is off course noticeable. I play it on my M5 Note in low graphic settings and it still lags a bit but not much. Even on my M6 Note, it is smother but still some frame drops here and there. So, all MEIZU phones are capable of running it at least on low settings. Honestly, not all can afford to play PUBG PC version either due to its high end requirements or Price. But they have done a terrific job to release this game for Mobile Platform and that too for free. They have tried to provide the same experience as PC on Mobile and I have not seen such FPS game on Mobile Platform. PC version is so tense and difficult. 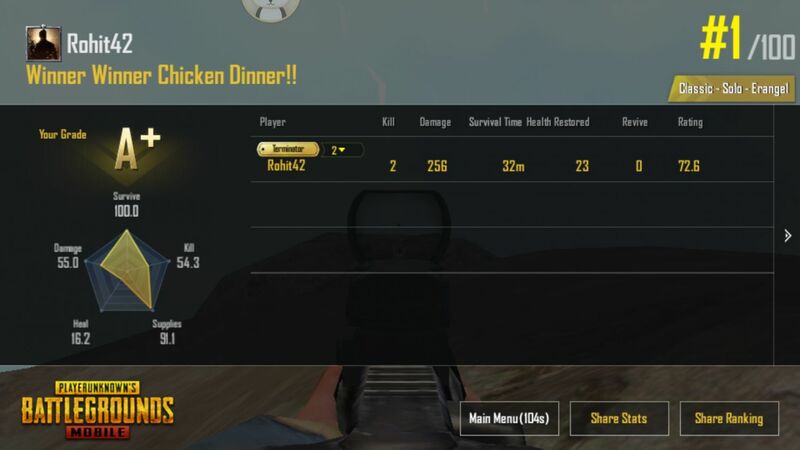 But Tencent also released an Emulator with which you can play PUBG Mobile in your pc but you will match with other emulators players. You can download the Tencent Official Emulator from the bottom of this thread. A game gets boring if you master it. But this game is not a game you can master easily. The fact that it is a multiplayer game, makes it more special. You can make some new friends or make better bonding with your existing friends. Also the they are providing new content with updates regularly. Version 0.6.0 is around the corner and it is so amazing. The officials are so much supportive too. 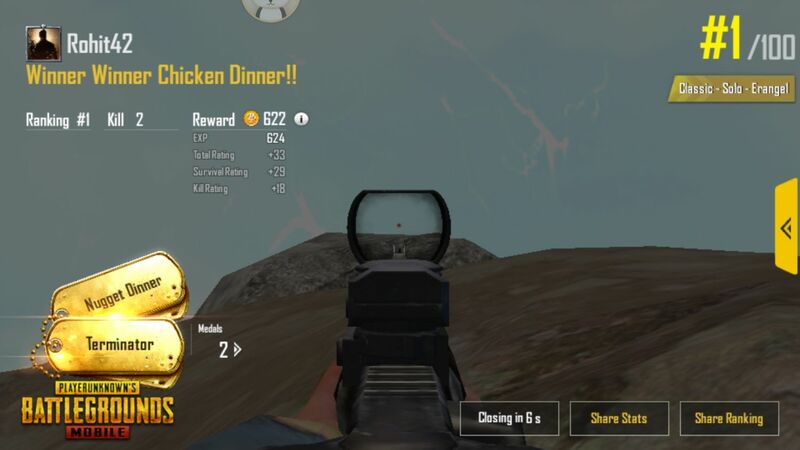 They will feature your PUBG Mobile live streams on their official social media channels and website if it is good and getting good response from users. I am wondering, this is just starting and this game has achieved a lot. Many YouTubers and streamers also got a Boost from this game. For me, this is one of the best FPS game ever on Mobile Platform and I see it on top for a long time. So, did you like this game? Do you already play this game? If yes, share your Username in comment so that we can add each other as friend and our community will be even stronger. Also don't hesitate to share your maximum kills and favourite loot locations. such a long boring content. 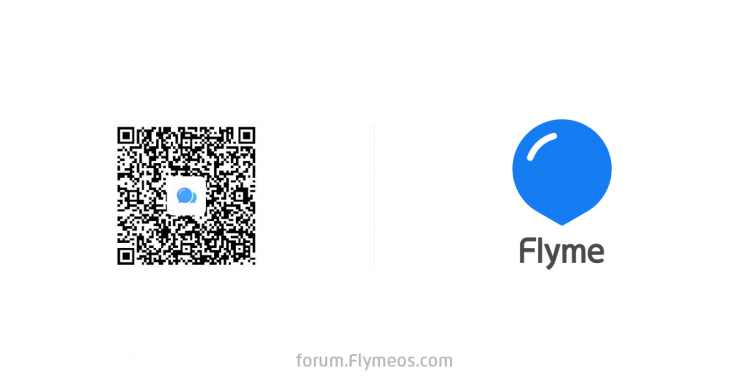 Tell me about Flyme 6.3 in meizu m2 or flyme beta on meizu m2. such a long boring content. Tell me about Flyme 6.3 in meizu m2 or flyme beta on meizu m2. RIP meizu....... The owner of the company and flyme administrator should go to hell. Abhishek_M ...： Lol... You say that it doesn't lag but then say that you notice frame drops how are both different? ?